Lockout banners vividly and graphically show when equipment is locked out! 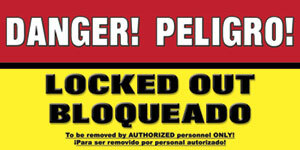 Our Lockout Tagout banners are designed to be place on, around or near equipment that is locked out. Lock out tags are often overlooked. A Lockout banner is highly visible and hard to miss. Save lives, injuries and equipment by using lock out tag out banners. Need a CUSTOM LOCKED OUT banner? Just email or call Cyndi and she will design one for you. Our Locked out banners for lockout tagout situations help reinforce the fact that the equipment is locked out and is not to be used. Unlike those tiny bland banners offered by others, our are highly visible reinforcing equipment safety and helping save injury and even lives as well as equipment. Need a custom lock out tag out banner, just call us and we can design one for your unique situation. Energy sources including electrical, mechanical, hydraulic, pneumatic, chemical, thermal or other sources in machines and equipment can be hazardous to workers. During the servicing and maintenance of machines and equipment, the unexpected startup or release of stored energy could cause injury to employees. Failure to control hazardous energy accounts for nearly 10 percent of the serious accidents in many industries. Proper lockout/tagout (LOTO) practices and procedures safeguard workers from the release of hazardous energy. 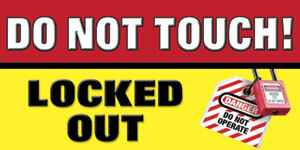 Our Lock out tag out banners help prevent injuries. Need a Lock Out Tag Out SIGN? 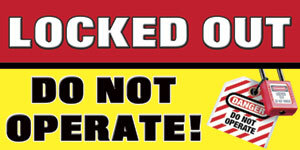 We can turn these lock Out banners in to a sign for you facility of any size. Want more information on a Lock Out sign? Call Bob Metz at 901-759-0932 Central Time.